The EMD SW1 is a 600-horsepower (450 kW) diesel-electric switcher locomotive built by General Motors' Electro-Motive Corporation (later Division) between December 1938 and November 1953. Final assembly was at EMD's plant at LaGrange (McCook) Illinois. The SW1 was the second generation of 3,402 cu in (55.75 L) switcher from EMD, succeeding the SC (cast frame) and SW (welded frame). The most significant change from those earlier models was the use of an engine of EMD's own design, the then-new 567 engine, here in 600 hp (450 kW) V6 form. 661 locomotives of this design were built, not withstanding diesel switcher production having been suspended between 1942 and 1945 by the War Production Board, as the 567 engines were needed elsewhere, mainly for U.S. Navy LST vessels. The SW1 introduced a 6-cylinder version of the 567 (later 567A) series engine to EMC/EMD switchers. Developing 600-horsepower (450 kW) at 800 rpm., this engine remained in production until 1966. Designed specifically for railroad locomotives, this was a supercharged 2 stroke 45 degree V type, with an 8 1⁄2 by 10 in (216 by 254 mm), bore by stroke, giving 567 cubic inches (9.29 L) displacement per cylinder. A D.C. generator provides power to four motors, two on each truck, in a B-B arrangement. The SW1, like most EMD switchers, use the AAR Type A switcher truck. EMC/ EMD has built all its own components since 1939. This sound recording courtesy of Eureka Springs and North Arkansas Railway Company, Scenic/Heritage railroad, and very helpful Engineer Tom LeClair. Visit arranged by Loy Spurlock. All sounds recorded by AJ Ireland at Eureka Springs AR, June 22nd 2007. Note: This SW1 prime mover has significant low-frequency components at idle and low notch settings, so the speaker enclosures should be as large as possible behind the diaphragm to extend adequate frequency response below e.g. 300Hz. This will ensure a more "full" sound that does not appear thin or "tinny". 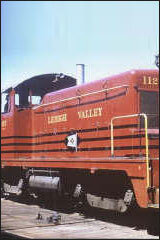 Each engine we have recorded has a distinct 'personality', so a particular locomotive example may sound slightly different due to unique e.g. tappet, crank-rate shell vibrations and exhaust-stack differences. Horns and bells are often moved between locomotives, and some roads may change/upgrade prime-movers, or change a normally aspirated engine with turbo-chargers etc. For CV155=01 ["Semi_automatic Notching"], the Prime mover lowest Notch setting is set by the throttle speed setting. F6 (ON) can increase the Notch and F7 (ON) will decrease the Prime mover to the minimum notch set by current throttle setting. If you leave F5 on, you can wind the engine handbrake forever!